LASH beLONG™ Client Consultation Cards 25 pack are an essential to the lash extension client confultation process. 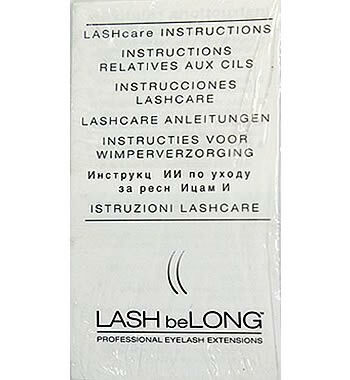 LASH beLONG™ LASHcare Instructions (25 count) are an essential to the lash extension clients after lash application. LashCare Instruction provides clients with after care instructions. Back of instructions provides spaces to fill in time and date for next appointment for full set application (or refills). LASH beLONG™ Brochure is FREE with any purchase Lash beLong product. Limited 3 brochure per purchase. Please note LASH beLONG™ Brochure is currently out of stock; Item will be available again shortly. LASH beLONG™ Station Talker is a mini table display (5 inches square). LASH beLONG™ Window Decal can be placed on store front windows to grap customers attention.